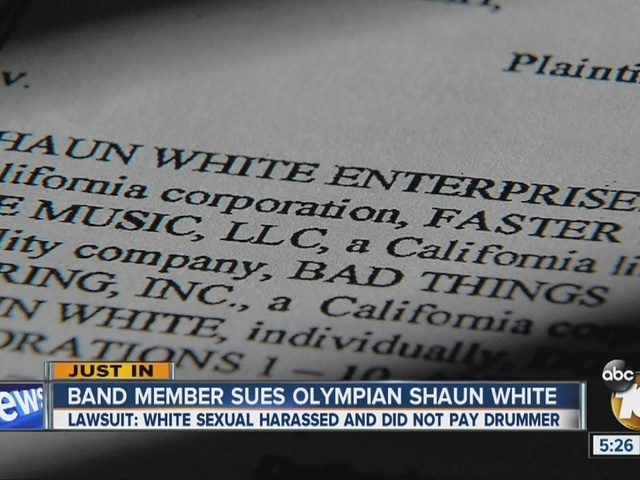 A drummer in Olympian Shaun White's band said the gold medalist sexually harassed her and did not pay her for being in the band Bad Things. The lawsuit was filed in San Diego Superior Court. In the documents, Lena Zawaideh said she met White in 2007 and started playing music together soon after that. The documents state Zawaideh stopped getting paid in 2013, even though she continued to play with the band until 2014. The lawsuit said White stopped paying her because she "did not need the money." It also accused White of "outrageous conduct ... sexual harassment, innuendos, threats, wrongful statements, [and] contract breaches." Zawaideh said that in March 2014, White forced her to practice while she was sick. She also asked for an explanation why she was not being paid while other band members were. She did not get a response from White, according to the documents. The lawsuit also states that in July 2014, "White demanded that [Zawaideh] cut her hair. She refused to do so. During that time period, White stopped speaking to Zawaideh and would only glance at her with a 'dark, threatening and angry face.'" White's representatives, have not yet responded to interview requests. The attorney representing Zawaideh said they are waiting on a formal answer from the defendants.